Offers for The Ritz-Carlton Rewards® Credit Card, HSBC Premier World Elite Mastercard® credit card and HSBC Premier World Mastercard® credit card are not available through this site. All information has been independently collected by AwardWallet and has not been reviewed or provided by the card issuer. Please see our card marketplace for available offers. Global Entry is a US customs screening program that allows low-risk, pre-approved, international travelers expedited entry into the United States. Since US Customs and Border Protection runs the program, it also allows members to use TSA Pre✓ lines when traveling domestically. It’s an excellent tool for frequent travelers and easy to obtain for free through various travel rewards credit cards. I first joined Global Entry in October 2013 after opening The Platinum Card® from American Express. Fast forward five years and I realized it was time to renew. I wanted to avoid any lapse in my membership since I use it to access the TSA Pre✓ lanes on a weekly basis. It turns out your membership lasts slightly longer than the five years advertised. For example, I applied in August 2013, but my expiration date was March 14, 2019. CBP sets the expiration date as your birth date immediately following your five-year anniversary and they allow you to renew your membership a full year in advance. However, this does not reset the clock or cause you to lose a year of membership should you choose to renew early. If you were an early adopter and joined around that time, you’ll notice that the website is entirely different now. You’ll need to create a new account for Login.gov. Don’t worry; your information will still be there when you transition. Fortunately, I was aware of this new system when I updated my Global Entry membership after changing my last name. 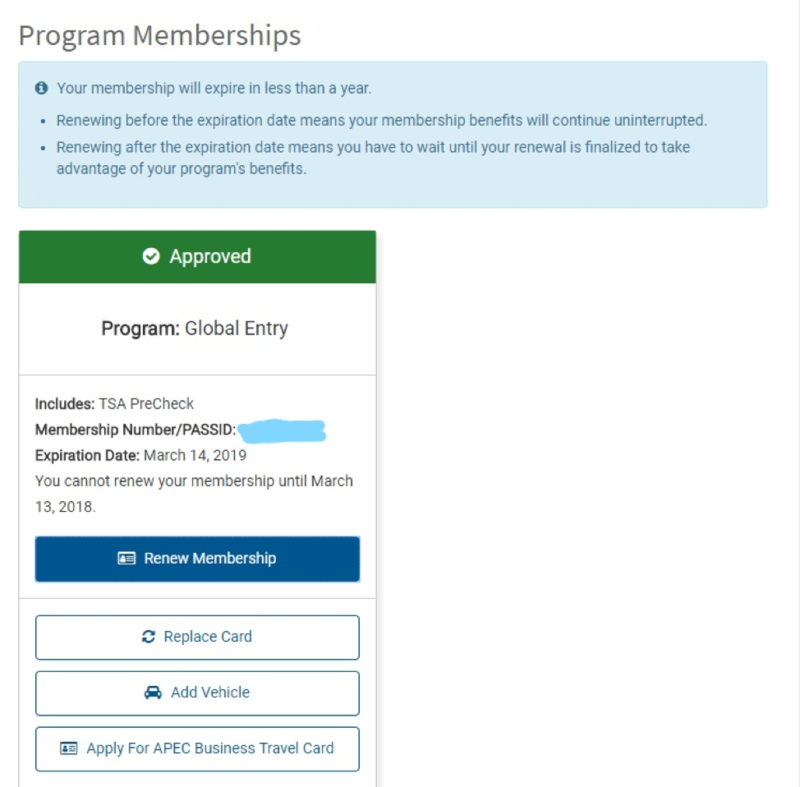 Once you’re logged in, you just click “Renew Membership.” Then select Global Entry. If you plan to travel by car between Canada or Mexico, then also consider applying for NEXUS or SENTRI at the same time. 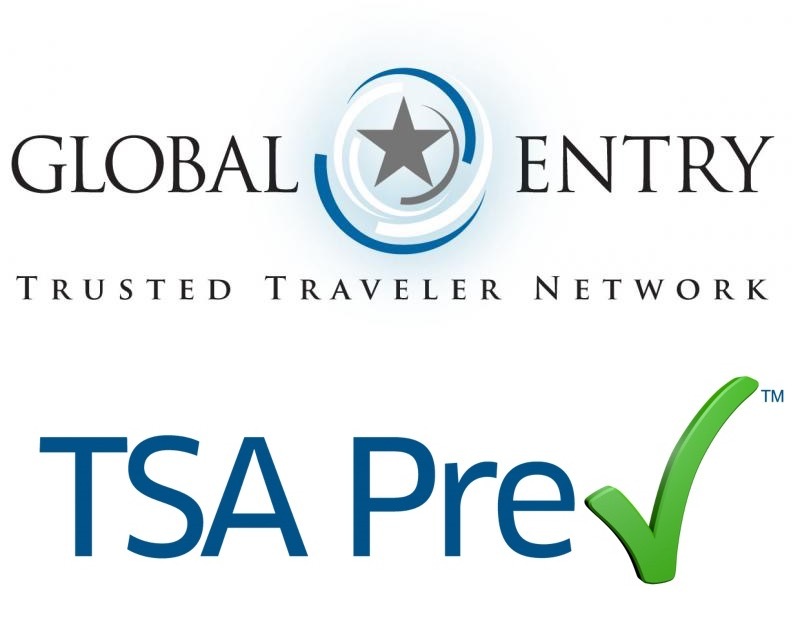 Keep in mind that you can always use your Global Entry Trusted Traveler card to re-enter the United States in the expedited lanes, but you must have NEXUS or SENTRI to use the expedited lanes going into Canada or Mexico. Next, you either confirm or update all your personal information; a piece of cake if you haven’t moved residences in the past five years. After that, you're prompted to select which countries you’ve visited since your last application. 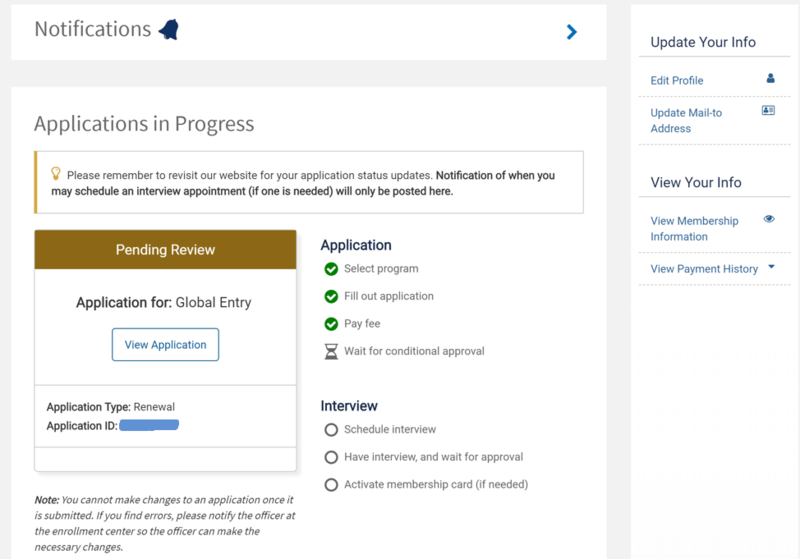 This was the most time-consuming part of my application, picking the 33 individual countries. After submitting the application, it will prompt you to input a method of payment. 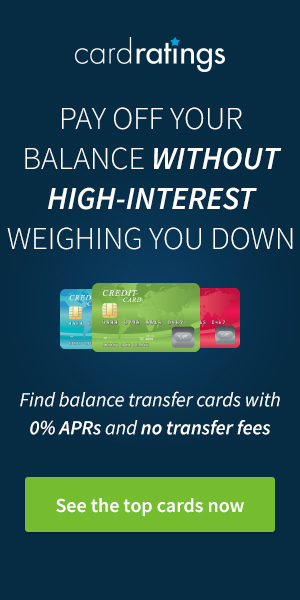 Make sure to use a card that will provide a $100 statement credit for this expense. Once your payment is processed, it will return to the main menu which displays your current application status. There are reported rare occasions in which applicants must appear for another interview for a renewal. Luckily, my application did not require another interview and approval took about five weeks. 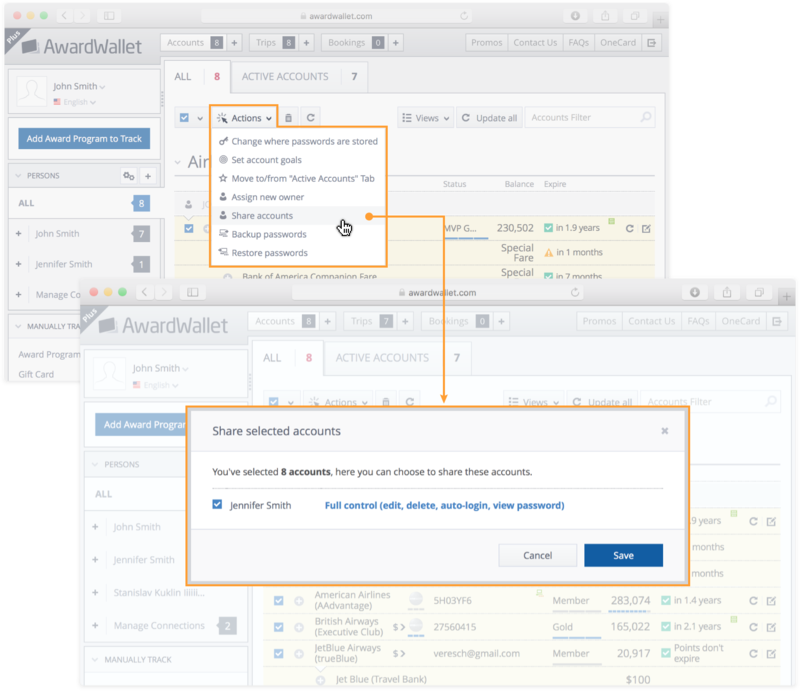 Did you know that if you connect your AwardWallet profile with another AwardWallet user, you can share your accounts with that user? Select the desired accounts and choose Share accounts from the Actions menu. If you live near an airport by the US/Canada border, definitely consider applying for Nexus. It’s only $50 and includes Nexus, Global Entry and Pre-check! Half off the just GE price with an added benefit. I live nowhere near Canada, but for those that do, it’s a shame that with so many credit cards offering TSA PRE / GE credits, I don’t think a single one of them can be used for Nexus. Perfect time for this info since we were just getting ready to renew. Thanks for the detail process! We have loved having Global Entry and TSA Pre for our travels. It’s a no-brainer for international travelers! Thank you for that, ICG! I’m a veteran travelerbut new with award wallet. I just paid $85 for tsa pre check…was approved and got my ktn number. But the Nexus idea sounds good for another $50. Also…can you recommend a couple good CCs to apply for…looking for bonus points or miles and annual extras…without points or miles ever expiring. I guess I missed out on the 100,000 miles cards a few days ago…might that come ba k.
Definitely another upvote for Global Entry and TSA Precheck. Though I will say that PreCheck is very hit or miss at different airports with limited times. Also, lately more issues with Global Entry kiosks not working or limited at different airports. 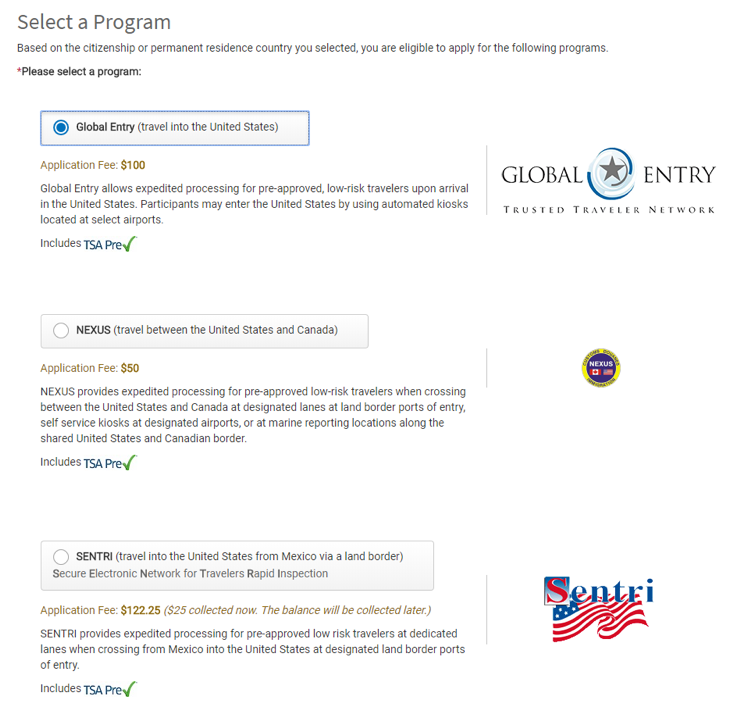 Can you share your experience changing your name on you Global entry account? Sure! I went through that a few years ago. Basically it’s the same process. Just make sure you get a new passport with your new name first. After that, you login to your account and initiate the process online. Unfortunately, you will be required to go to a Global Entry office to present your new passport and, in my case, marriage certificate. Good info regarding birthdate and expiration date. Didn’t realize what it was based on. Can plan better knowing this. Thanks! Just ran into this today. Didn’t even realize my global entry had expired. Why don’t we get notice when it’s time to renew? And when do we receive our Global Entry card? 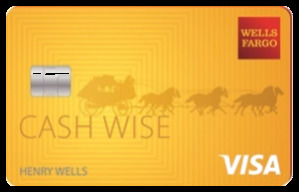 Does the new card reflect the new renewal date (that’s the only way you know the renewal date)? I received my Trusted Traveler card about six weeks after submitting my renewal application. You can see my exact timeline at the very bottom of the post listed in bullet points. This is so great and detailed! When they ask for countries visited do you count countries that you were just in the airport, waiting for your connecting flight to the final destination? Include a country if you have a passport stamp. 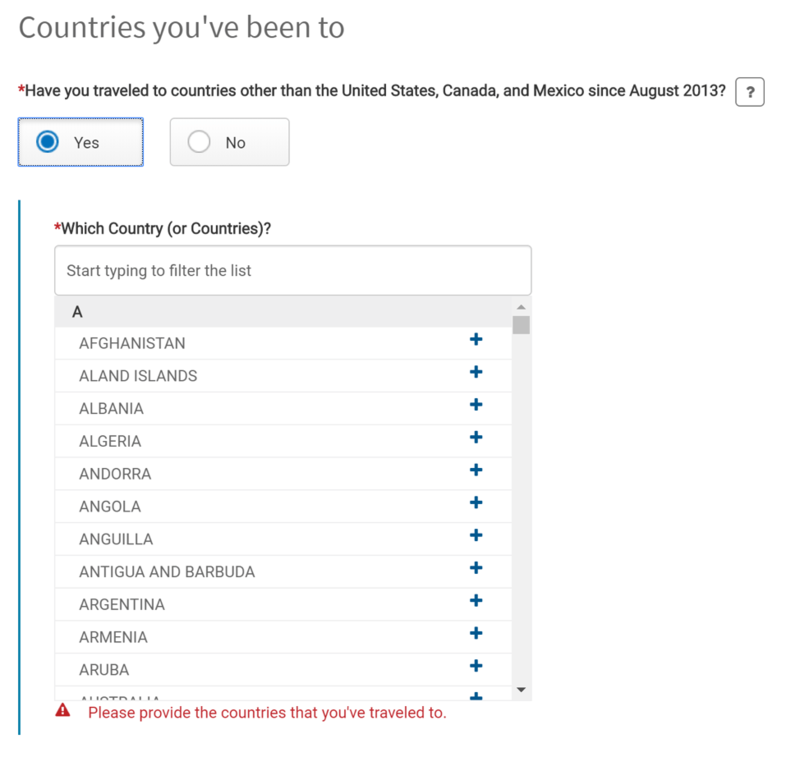 Don’t include transit countries as you technically never entered the country. What if you have moved residences (more than once) in the past five years? Is that going to be a problem? Nope! Not at all. I moved five times since I originally became a Global Entry member. Just make sure to document all your previous addresses and the correlating dates you resided at each one. The hardest part filling out that section was remembering all the different zip codes. Had to double check old bills and Amazon order confirmations to be sure. These entry cards sound like another form of long term electronic visas to me. Good info reference the actual expiration date; thanks. I’ve used mine for entry only once – it was a speedy process coming from Germany. My spouse just got her GE, so we can enjoy it early next year when we return from Asia. good update. reminds me to check my passport experation. Thanks for the info. It just reminded me about renewing early next year. I definitely need to check on the date that my Global Entry. I don’t want to have it expire since I use it a lot (though not every week) Other than the regular benefits, I have found that by showing my Global Entry card at Canadian Airport Security Checkpoints I am allowed to go to the front of the line, just as Nexus Card holders may do. I haven’t tried it in a ground border crossing though (and I probably wouldn’t try) I have plenty of cards now that will cover the renewal fee. Thank you for the walk through. I was a little perplexed by their new website and process. Bookmarking this for when I need to renew in 5 years. Just did the original this past month – very easy. Was about 1 week from online app to being able to schedule interview. Interview was quick and was basically just going over rules (like don’t get arrested or you will lose your GE) and getting pic taken/fingerprints. Had approval within 1 hour of the interview. NEXUS is ideal for families who travel, kids under 18 are free, so just $100 total to have 2 adults and 2 kids with TSA PreCheck, Global Entry and Nexus. Thanks! Prompted me to check my Pre-check expiration date – unfortunately it is exactly 5 years and not tied to birthdate. 33 countries?! Wow! Your passport must be full. How many times have you had to get extra pages? This is good info to have when the times comes for me to get Global. Right now I use the Mobile Passport app. and our jobs just don’t let us. I know people say the interview process isn’t too daunting but I admit that’s kinda holding me back, too. I think I need to go back and revisist your global posts for more info. Also, the HSBC Premier World Credit Card, besides the Elite, offers a TSA Precheck refund. I was wondering about this. Thanks for letting us know. The credit card reimburse is nice too. Thanks. This just saved me some time and some money! I am due for my TSA Pre-CHeck Renewal coming up this spring. Is there an quick online renewal option for that? I was considering Global Entry and it might be time to convert over. I would be nice to have an online renewal option in the future. Can Global Entry be used when returning from Canada or Mexico by Air? I will have to do this soon.